Medical tourism is a highly complex concept: Treatments obtained abroad are not always manifestations of a conscious act of decision-making. In ‘Traveling for Treatment’ the author proposes a set of characteristics that differentiate medical tourism and medical travel from other health services. 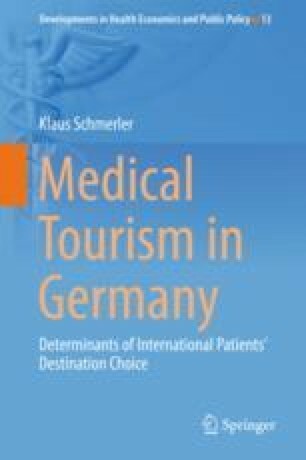 In an overview over the state of research into medical tourism he briefly presents data sets that attempt to capture medical tourism flows worldwide and provides a detailed description of data sets that record inbound medical tourism in Germany. Moreover, he extensively takes stock of candidate drivers suggested by the medical tourism literature and derives his empirical focus on cultural proximity and networks from health care market imperfections and from the literature on international trade, medical tourism, and marketing.